Maggie Hope, formerly one of Winston Churchill's secretaries, has been recruited into MI5. She's hoping to be dropped behind enemy lines, putting her language skills to good work for Britain. 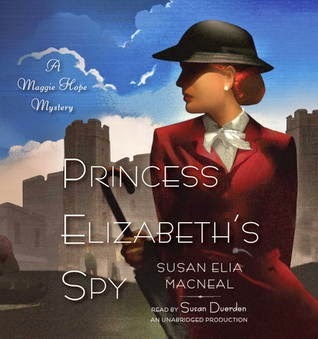 Instead, she finds herself assigned to go undercover at Windsor Castle, as maths tutor for fourteen-year-old Princess Elizabeth. As lowering as this seems, there are hints of a plot to kill the king and kidnap the princess, and install the Duke of Windsor as a puppet king after an invasion. Maggie is there to soak up information and identify any possible threats to the princesses, Elizabeth and Margaret. She finds herself in a strange mix of privilege, patriotic austerity, and petty rivalries. MacNeal does an excellent job of portraying the king's equerry, an RAF pilot who was shot down and badly burned, but is expected to return to duty in a few months. No one at the time knew the phrase "post-traumatic stress disorder," or understood what it could do to a soldier. Without being false to that fact, MacNeal shows what it in fact did to this pilot, and how it affects his choices. Portrayals of the ladies in waiting are more limited but equally clear and interesting. Maggie's own intelligence, insight, and inexperience are equally beautifully shown, as well as her still troubled relationship with her father. Overall, the book is a nice balance of quick-moving plot, recreation of a critical period in history, and character development for Maggie, her friends, and her co-workers and opponents. Recommended for anyone who enjoys historical mysteries.